I'm starting off today's What I Ate Wednesday with this wonderful sandwich that my husband made recently. It's a thing of beauty, don't ya think? Tofu slices cooked in barbecue sauce, topped with sautéed mushrooms and onions. 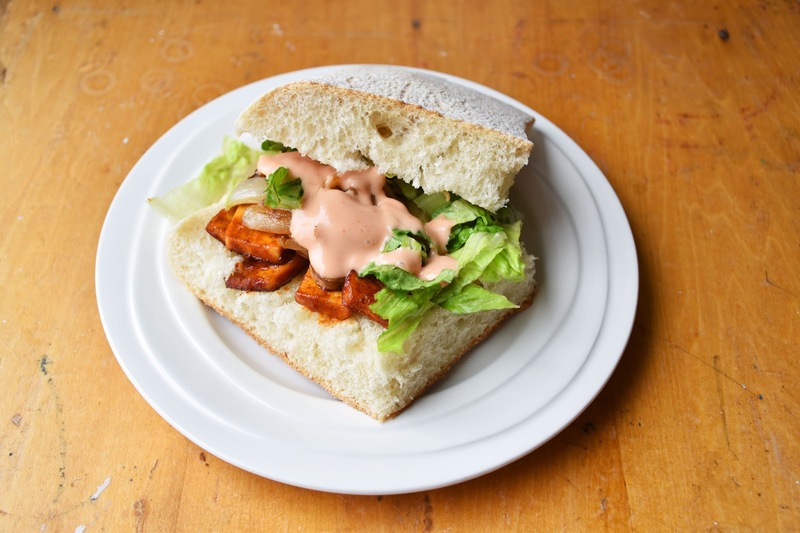 A little bit of lettuce and a sauce of ketchup and vegan mayo with a dash of Bragg's Liquid Aminos. And a delicious ciabatta bun. 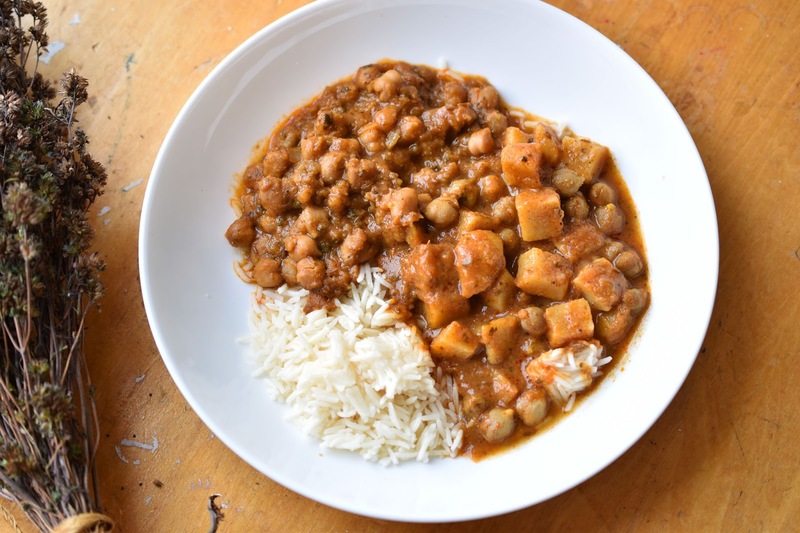 Simple (especially when you didn't make it yourself), vegan and delicious. When the kids and I were in Toronto's Parkdale neighbourhood shooting a scene for the Organic Panic Christmas special, we took a break at Boreal Gelato Café. 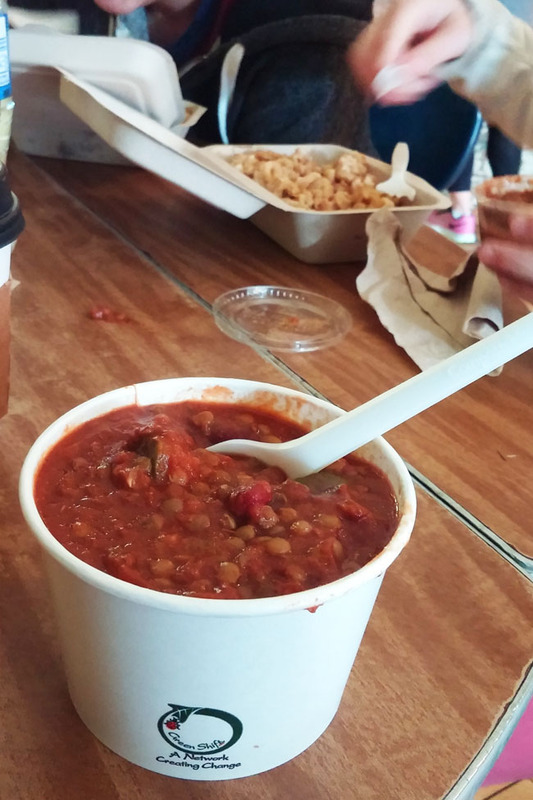 One of their vegan options was this hearty lentil chili. They have vegan gelato too, but unfortunately we didn't get time to sample them. The kids weren't happy with me. Another day we were shooting on the Danforth and the whole family stopped at Magic Oven to get pizza for lunch. 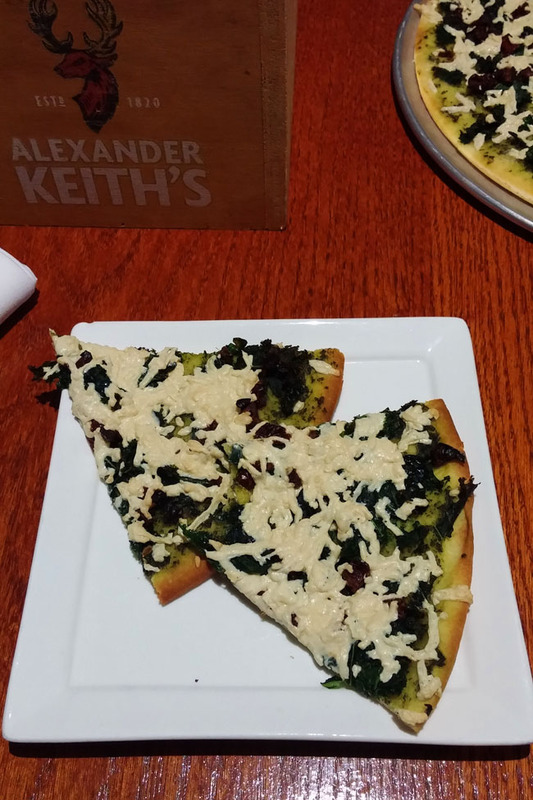 I chose the Black Magic vegan pizza with pesto, steamed kale, sun dried tomatoes and vegan Daiya cheese. Here's the part where we look at a full day of eats. A not so impressive day actually. We were pretty busy on the weekend and I didn't get out to the grocery store. I did whip up some vegan banana bread though. 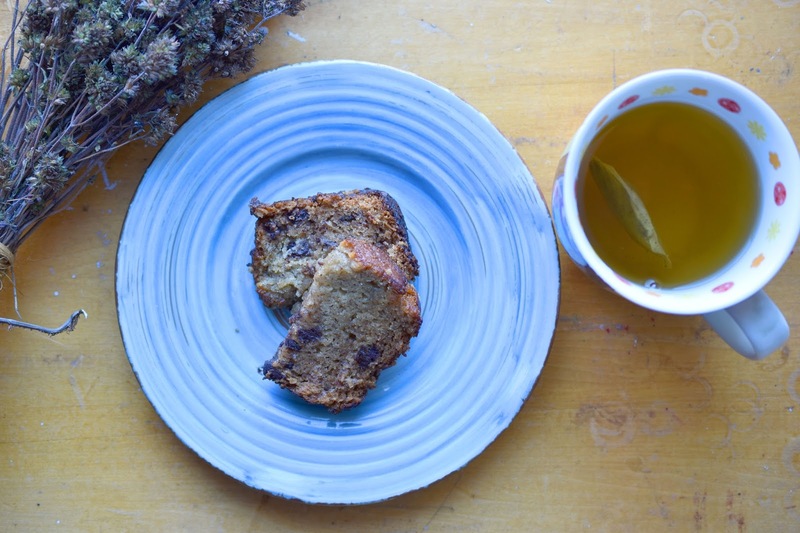 So, Monday started with a breakfast of vegan banana bread and decaf green tea. For lunch, I went straight to the pantry cupboard and pulled out three packages - pre-cooked basmati rice, chana masala and a curried potato dish. Didn't even look for a veggie! 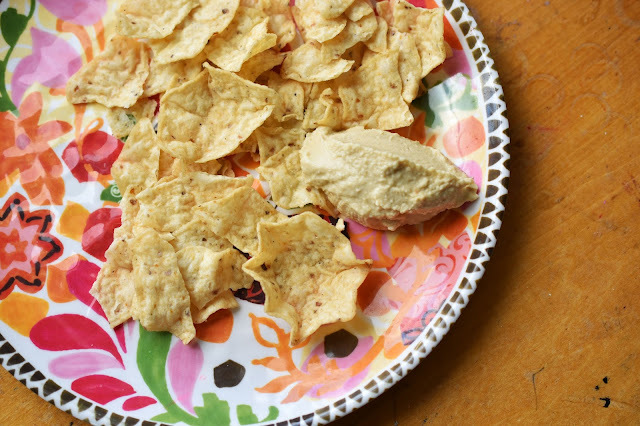 A short time later I was still hungry, so I found some scraps of tortilla chips left in the bag and ate them with hummus. For dinner I baked tofu slices in a mixture of sesame oil, orange juice, tamari and a few more things - pretty much like this recipe here. It was very good and made me wish I had used two blocks of tofu instead of one. 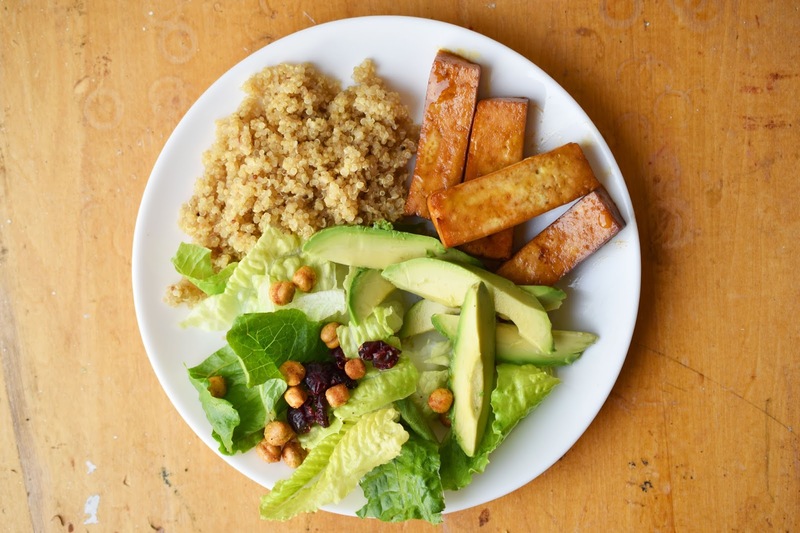 We also had quinoa cooked with a bit of veggie bouillon and Bragg's and a salad topped with dried cranberries, avocado and Saffron Road roasted chickpeas. That's all I photographed on Monday, but suffice it to say I knocked back a few jujubes left over from my daughter's birthday party. How is your week looking? Eat at any great restaurants lately? ciabatta always makes sandwiches that little bit better (especially in a sandwich press)! Ha at not looking for a veggie-- I know that feeling!